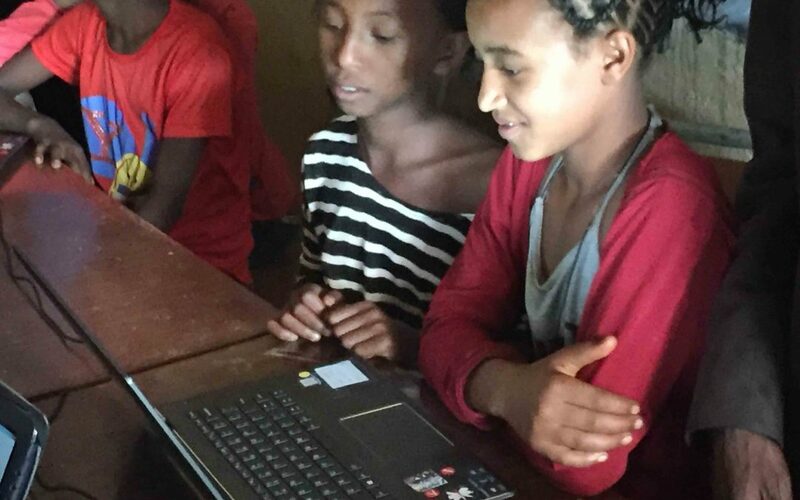 Kids and computers: These days you rarely find one without the other — except in Ethiopia, the rest of Africa, and most of the developing world. In these places, children, whatever age–adults for that matter–have no access to computers. An early generation semi-smart phone is as good as it gets for some adults. A truism of technology, regardless of language, is that children are very fast at learning how to use computers. And with a bit of software that teaches English, math, colors, animals, geography, and other basics, a modern laptop is a linchpin to new plateaus of learning. Kids love computers. 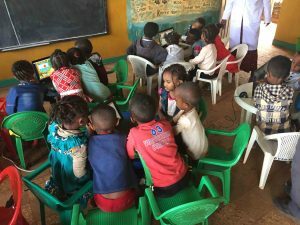 These children are the first in western Ethiopia to have hands-on learning daily and weekly with touch screen laptops. Hello, virtual reality. Access to modern laptops is essentially non-existent for school children of all ages even including many at universities in Ethiopia. These ever curious children are students at either St. Mary’s or St. Michael’s in Gimbi, Ethiopia. Both schools are run by Sr. Susy (Sr. Maria Susana Rodriquez) of the Marianitas congregation with essential help from two local Catholic priests, Abba Tilahun and Abba Berhanu. 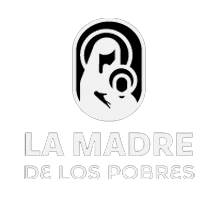 La Madre de Los Pobres’ board member, Peter Wise, and his wife bring donated computers and spend 1-2 months each year teaching children and the teachers of the children how to use the machines. Yes, access to computers for the vast majority of school teachers is practically non-existent in Ethiopia so these fortunate teachers embrace learning and teaching their students with joyful smiles and determination. Peter and Patrice live in the convent with Sr. Susy and her sisters. 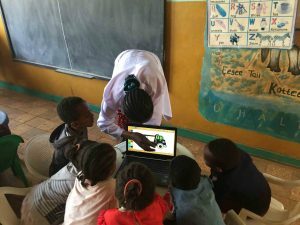 These two schools utilize 6-8 laptops per classroom of 20-40 students. More computers would be better, of course. The kids huddle around the machines taking turns operating the mouse and the touchscreen. Quickly the children team together to answer questions and understand the learning games. The room quickly buzzes with excitement and pointing. The 3rd and 4th graders are exceedingly fast learners, as you might expect. We wish that we could get more computers into their energetic hands and minds. Someday we hope to help their schools become internet learning centers for children, their parents, and friends. At their own expense, Peter and Patrice have begun planning to return in February 2018. We invite your support of these two schools and the students.